Blog : Pear With This or Pear With That? Pear With This or Pear With That? I don't know what it is, but I keep buying pears. Green ones, red ones, brown ones...I don't even really like them all that much, but week after week, they fill my basket. It must be my desire for a little variety after the summer berries and stone fruits are gone. More often than not, I let those pears get overripe on my counter, which leads me to eat the entire bunch in the span of two days before they're too far gone. I halve one for breakfast to share with the hubby, I cut another up for a salad with spinach and dried cranberries, and yet another gets drizzled with ginger balsamic vinegar and a sprinkle of cinnamon. Hmm...I guess they aren't so bad after all. -Pears are high in antioxidants and fiber--be sure to eat the skin! I don't even know how many times I've made this recipe--it's so easy and satisfying and makes your kitchen smell like fall. It's easy to half or double, and I even canned a bunch as Christmas gifts one year. It may be simple, but it's a mainstay in our house. It's from Ina Garten's 'How Easy Is That?' cookbook, but I found it (complete with step-by-step photos) on someone's blog and provided the link below. 1. Zest and juice the lemon and oranges into a large non-reactive pot, such as a Le Creuset dutch oven. Preheat the oven to 350 degrees. 2. 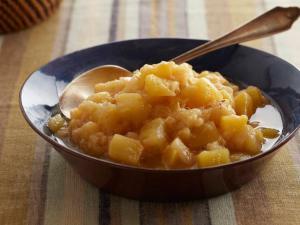 Add the apples, pears, sugar, butter and cinnamon into the pot. Stir to incorporate, then place in the oven. 3. Bake for about an hour to an hour and a half, or until fruit is tender. Whisk to create a chunky sauce. Holly R. Layer received a B. A. in Journalism from Penn State and served four years in the U. S. Air Force before deciding to go back to school to become a Registered Dietician. She loves running, reading, fine stationery, colorful kitchen gadgets and ALL things food-related. An avid cook and baker, you can find her in the kitchen most days whipping up something yummy. Too bad her husband, Andrew (an East Aurora native) is the pickiest man alive!